The 3¢ U.S. Imperforate Stamp of 1851-1857 is certainly one of the world's most studied stamps. An estimated 362 million copies of this stamp were issued between July 1, 1851 and December 1857. Among the many ways to study this stamp, "Plating" is one of the most interesting. Plating is the practice of identifying an individual stamp's position on a printing plate. Imagine a jigsaw puzzle where all the pieces seem to look the same. However, after carefully inspecting your pieces, you see that each piece is different and clearly has its own unique position in the puzzle. Then imagine those pieces are not packaged in a pretty little box - instead, you must search throughout the world to find them. If you like jigsaw puzzles, you are a prime candidate to plate stamps. Finding those pieces and completing that puzzle is the challenge and fun of plating – and plating is likely the most challenging jigsaw puzzle imaginable. New platers usually don't tackle the entire 2,600-piece puzzle. Instead, they begin with one of the easier 100-piece puzzles and progress from there. As you will soon see, there are 26 of those 100-piece puzzles that make up the complete plating, and starting one of them is a great way to begin! This stamp has several interesting design elements. The tessellated lathe work and the slight off-balancing of the rosettes with the frame lines and vignette are quite intricate. Four key stamp characteristics that help platers are Color & Impressions, Inner Lines, Reliefs, and the existence and placement of Guide Dots. Additional important stamp characteristics include Recuts, Shifts and Transfers, Cracks, "Misplaced features", and the many thousands of slight variances in how the engraver's knife uniquely retouched each stamp. 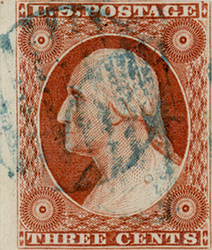 Scott Catalog numbers 10, 10A, 11 and 11A are assigned to the imperforate issue. Scott identifies two types - Type I and Type II, to distinguish the absence or presence of inner lines. Scott numbers 10 and 11 include Type I stamps with NO inner lines. Scott numbers 10A and 11A include Type II stamps WITH inner lines. However Color distinguishes a number 10 from 11, and a number 10A from 11A. Since approximately 5.5% of the 362 million stamps produced were either 10 or 10A and the remaining 94.5% were 11 or 11A, it is critical to know the difference between a 10 and 11, or a 10A from an 11A, as scarcity greatly affects value. The accurate way to identify a stamp is to plate it. Please be aware that, beginning with the 2008 Scott Catalog, the definitions of "Type" for this stamp were changed. Under the old method, all imperforate stamps were Type I stamps, and all perforated stamps were Type II, as the old "Type"" definitions did not distinguish between stamps with and without inner lines. Those original two types are now four, with inner and no-inner line stamps identified as separate types for both the imperforate and perforated stamps. This can be confusing when reading information published before 2009. Addressing Color, the stamps commonly referred to as the "Orange Browns" were printed using Plates 1E, 1i, 2E, 5E, and 0 -- often called the "early plates." Those five plates comprise 1,000 unique plating positions. Orange Brown stamps with no inner lines [Scott No. 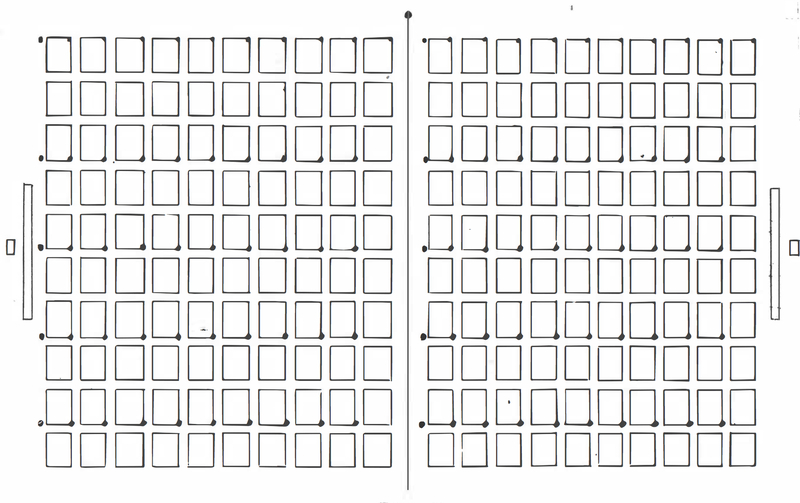 10] were printed from Plates 1E and 1i and are located in 129 positions. The other 871 positions have either one or two inner lines [Scott No. 10A] and were printed from all five plates. The Orange Browns were only printed for several months, which resulted in their rarity as compared to the later plates. The later plates, commonly called the "Dull Reds," were printed using Plates 1L, 2L, 3, 4, 5L, 6, 7, and 8. Those eight plates comprise 1,600 unique plating positions. 800 of those stamps without inner lines [Scott No. 11] were printed from Plates 4, 6, 7 and 8. 800 stamps with inner lines [Scott No. 11A] were printed on Plates 1L, 2L, 3, and 5L. Dull Red is a common color designation for a family of more than a dozen colors and shades. Learning to identify the many colors of the Dull Reds helps identify plates, since different colors were used to print stamps on various plates in various years. Stamps are printed from printing plates. 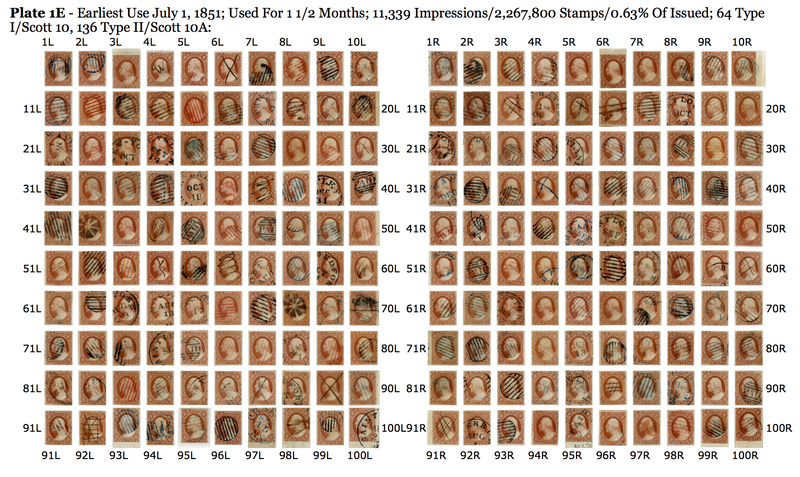 Each plate for this stamp contains 200 impressions, divided into left and right 100-stamp panes. Nine plates were used to print the imperforate stamps. 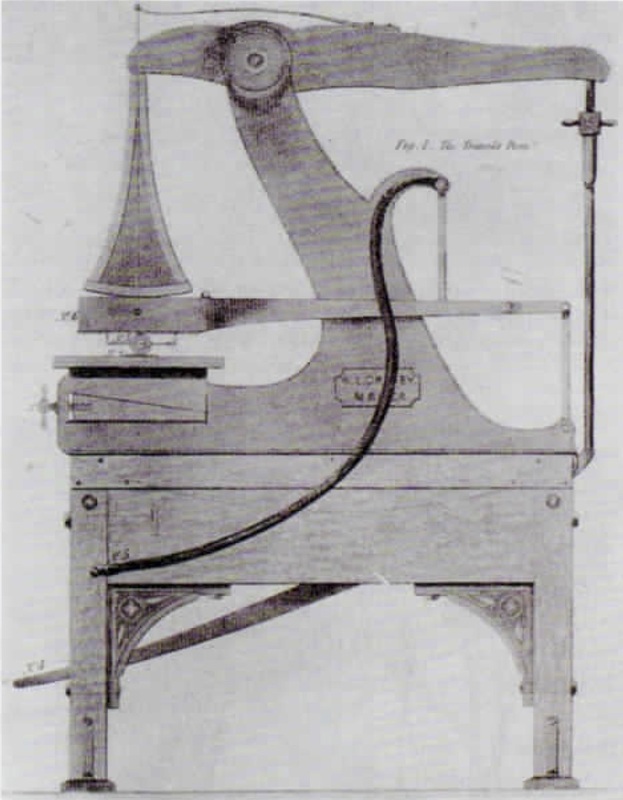 However, after very short periods of use, three of those plates were reworked by engravers and reused to print more stamps; and, one plate (Plate 1) was reworked twice. These reworked plates are called "plate states" and count as additional plates for purposes of plating. 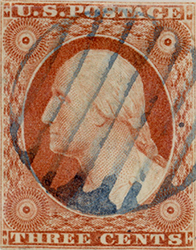 Therefore, for purposes of plating this stamp, the imperforate issue was printed using 13 total plates, consisting of 2,600 uniquely identifiable stamp positions. (4) the individual plate images are cleaned up and the printing plate is hardened for use. Each of the thirteen plates have a plate reference number. These plate numbers do not show on the plates and are not to be confused with plate numbers popular with plate block collectors. The thirteen plate reference numbers are 1E, 1i, 1L, 2E, 2L, 3, 4, 5E, 5L, 6, 7, 8, and 0. "E" stands for "early state", "i" stands for "intermediate state", and "L" stands for "late state" for those three plates that were reworked. This numbering does not always relate to the time the plates were manufactured or used; but, rather, is how they were identified by Dr. Carroll Chase in his 374 page treatise on this stamp - The 3c Stamp of the United States 1851 - 1857 Issue, revised edition. For example, Plate 0 was likely the fourth plate manufactured, and Plates 3 and 4 were put into use after Plate 5E. If you are going to get serious about plating, you need Dr. Chase's book. How Are 2,600 Positions Platable? The 2,600 positions of the thirteen plates are platable because every single stamp position on every plate was physically altered in some manner by the hand of an engraver. This is called Recutting. Hand engraving leaves unique results and, like a fingerprint, each stamp is unique. The goal of the engraver was to clean up and enhance the designs on the plates. The unintended consequence was unique platable stamps. Some stamps have much recutting to them, some have very little. This all affects the difficulty of plating particular stamps. 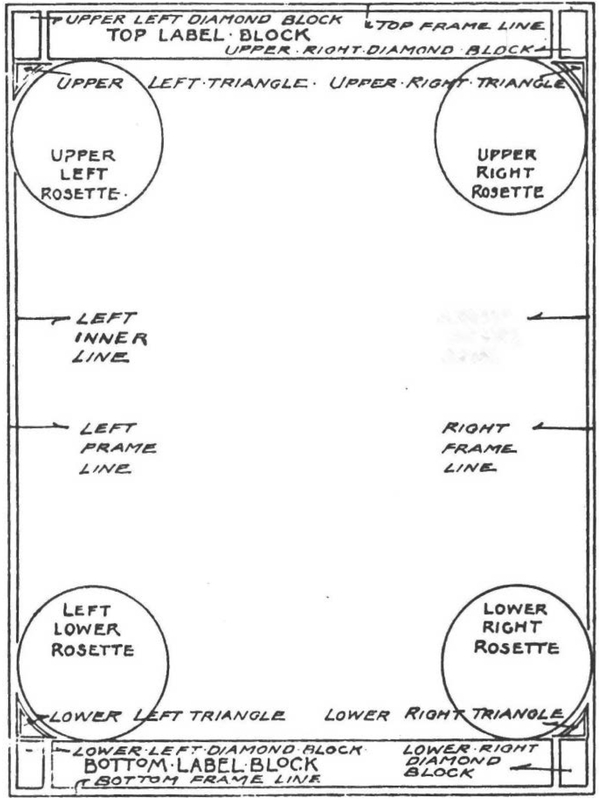 Most platers start with the right 3 columns of the left pane of Plate 3, as these stamps are very fully explained in Chase's book and easily identified with their extra frame lines and missing inner lines. Illustrations and very detailed descriptions of all 30 positions are in Chase. After this, the easiest and most available stamps to plate are Plate 1L. Stamps from this plate are fairly easy to identify due to the distinctive recutting of the top of the UR diamond block. There are lots of shifted transfers on this plate along with distinctive recuts and combinations of recuts of the lines in the UL, LL, and LR triangles and left and right inner lines. Plates 1L, 2L and 3 have the most available stamps (with 17%, 23.5% and 21.5% of total stamps produced), so are often the most plated. Plate 4, with 10.4% of total stamps produced, is the next most numerous and has the advantage of readily determinable plating characteristics; however, determining which position on Plate 4 is the right one for your stamp can be quite difficult. Dr. Chase's book helps you identify the plate for your selected stamp - or, at least, how to narrow the choice of plates to one or two. 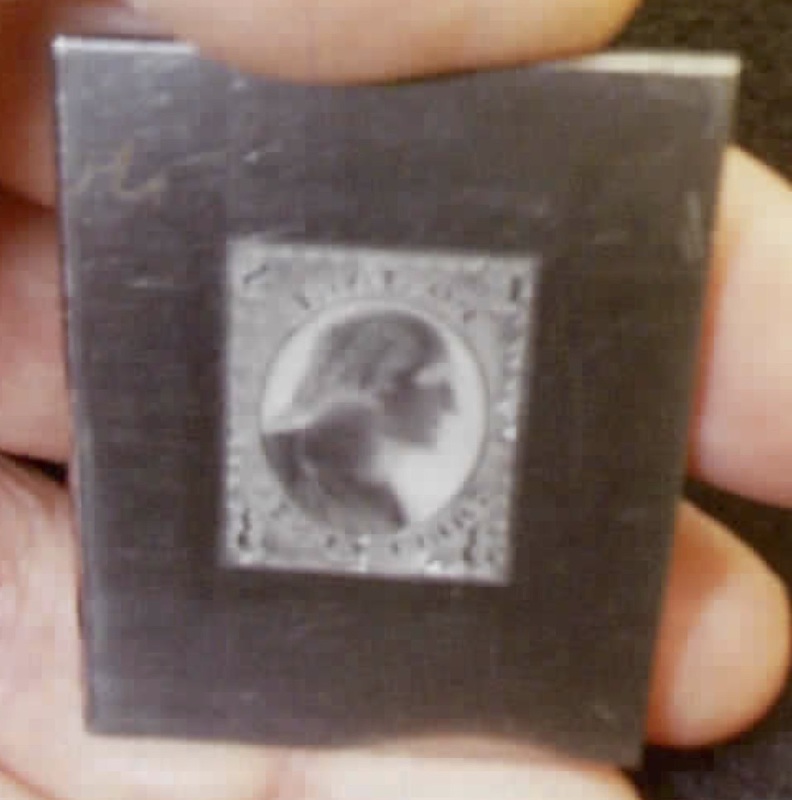 Examining the inner lines, the color of the stamp, and the characteristics of the stamp's impressions and recuts are key to identifying the plate. The summary below introduces the topic; much more detailed information is provided in the Identify The Plates section of this study. Many color shades have been identified for this stamp and they are explored in detail in the Identify the Plates - Color subsection of this study. However, for Plating, the goal regarding Color is to determine whether your stamp is Orange Brown or NOT. If it is Orange Brown, then, with rare exceptions, you know you are looking at the five early Orange Brown plates (1E, 1i, 2E, 5E, 0). If it is NOT Orange Brown, you are looking at the eight later Dull Red plates (1L, 2L, 3, 4, 5L, 6, 7, 8). The plates vary greatly in quality of impression, and quality and heaviness of recuts. Learning to recognize the various impression characteristics of each plate is important. Beyond the general impression characteristices of a particular plate, individual stamps in the same position may show very different impressions from one another due to plate wear, dry printing, differences in plate wiping, deterioration over the years, exposure to the elements, and so on. There are good summaries of the impression characteristics of each plate, but it really comes down to practice and experience and lots of attempts at plating. Once you have narrowed your choice of plates to one or two, you should then proceed to examine the plating characteristics of your stamp. Dr. Chase identified many plating characteristics, which are summarized below. For more information go to the relevant sections of this study. A relief is an impression of the stamp die as impressed upon the transfer roll. There are several reliefs on a transfer roll, so that plates can be produced more quickly than if a single relief was on the transfer roll. Due to slight differences in the die impression as entered onto the transfer roll, each relief on the transfer roll can be identified. This is the case with this issue. Until recently, three reliefs were known and identified for this stamp - Reliefs A, B, and C. Those three die reliefs are generally derived from differences in how the engraver cleaned up the tessellated infringements into the white oval of the original die. 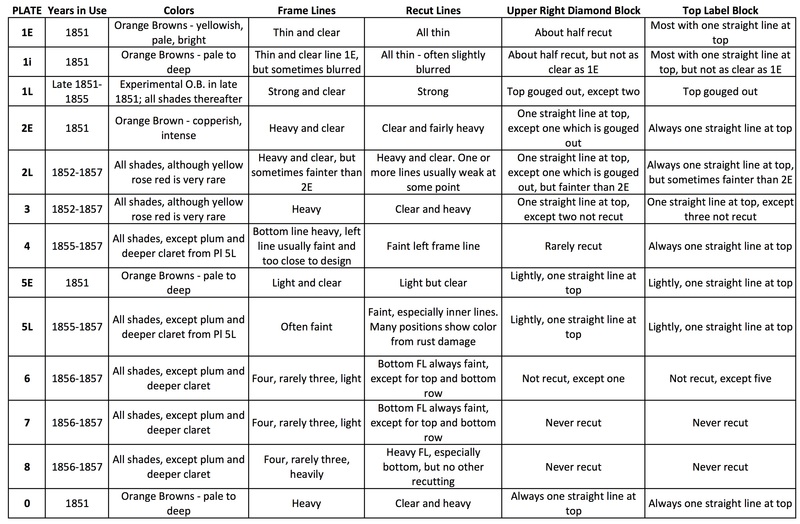 Virtually all plating information refers to these three reliefs. Dr. Carroll Chase identified 34 specific recuts for this stamp issue. He listed them plate by plate, then position by position, in his book, first published in 1929 and revised in 1942. USPCS Chronicles 2 and 3 added some edits provided by Dr. Chase. In February 1973, William K. McDaniel provided Condensed Plating Information in USPCS Chronical 77. A number of corrections and edits were subsequently provided in USPCS Chronicles 80 and 95. In August 1992, Mr. McDaniel published an updated version of his Condensed Plating Information in USPCS Chronicles 155, 156, and 157. He also identified four additional recuts 35 - 38. In February 2000 and August 2006, two more recuts were identified by Mr. McDaniel and listed in USPCS Chronciles 185 and 211. Dr. Chase originally identified the 2,600 primary inner line recuts for this stamp, plus an additional 711 recuts of various types, which always occur in combination with primary inner line recuts. By 2006, Mr. McDaniel changed a number of Dr. Chase's original recuts and also added the aforementioned new recut categories, plus other additions and deletions to Dr. Chase's original recuts. Many of those changes derived from a different application of the subjective "lines run too far up and too far down" standard that was employed by the two individuals. 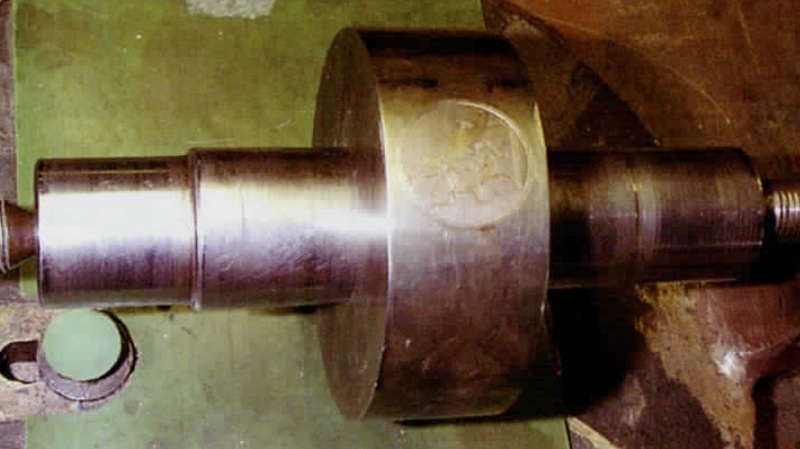 Some of the 221 changes that Mr. McDaniel made to Dr. Chase's original work appear to be accepted within the plating community, while others may be subject to further debate; however, they all are interesting and instructive to plating this stamp. Each plate has guide dots located in theoretically consistent places on a plate. Guide dots helped the siderographer align the transfer roll and properly placing impressions onto the plate. This was as much art as science, so there were mistakes, misalignments and much variation in dot positioning. All of these variations assist in plating stamps. You can see the upper left and upper right guide dots in the first stamp below and the lower right guide dot in the second stamp. Most stamps purchased during the 1851 - 1857 time period were used very close to the time of purchase. Customers often went to the post office, bought their stamp and used it immediately. If the stock of the post office was relatively fresh, then the date of cancellation can be very helpful in narrowing down plates choices. Of course, by definition, a cancellation date earlier than a plate's known first use date eliminates that plate from consideration. Comparing cancellation dates to Earliest Known Use (EKU) dates for plates is very useful in plating a stamp. There are 160 double transfers and 3 triple transfers spread throughout the plates. 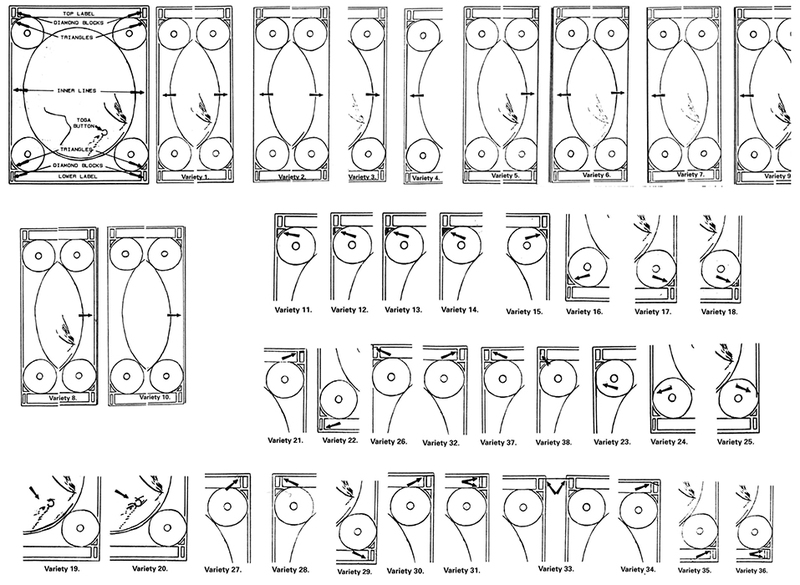 Most of these shifted transfers are in the reentered Plates 1i, 1L, 2L, and 5L; but, they are also heavy in Plates 1E, 2E, 5E, and 0. They are all noted in the database and specifically searchable. Plate 5L Left Pane includes 8 minor cracks and 6 major cracks. Plate 5L Right Pane includes 3 minor cracks and 1 major crack. Plate 5L is also noticeable for commonly showing rust in its stamps. The Left Pane crack positions are - Minor Cracks in Positions 27, 31, 44, 45, 55, 65, 78, and 80; and, Major Cracks in Positions 51, 52, 74, 84, 94, and 96. The Right Pane crack positions are - Minor Cracks in Positions 7, 71, and 72; and, Major Cracks in Position 9. 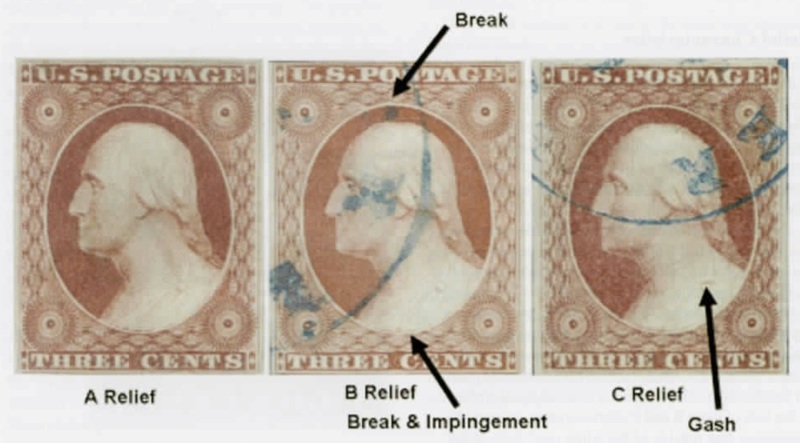 Major and minor cracks are noted in the single stamp profiles of each of the 2,600 individual stamps. There are 118 Misplaced Reliefs, of which three are B Reliefs, 53 A Reliefs and 62 C Reliefs. They occur sporadically through Plate 1E, in the first row and three other positions in Plate 1i, in the first row of Plate 2E, in position 10R of Plate 3, in 41 positions in Plate 5L, and, a small number of positions in Plates 6, 7, and 8. Misplaced reliefs are noted in the single stamp profiles. There are 69 misplaced guide dots spread fairly evenly through all plates, except Plates 6, 7, and 8. There are 41 accidental guide dots, mostly in the dull red plates. Double and triple guide dots are specifically searchable in the database. Misplaced and accidental guide dots are noted in the single stamp profiles. Dr. Chase made at least 224 helpful plating comments throughout his book. Those have been reproduced in shorthand form as comment notes included in the database and presented as part of the single stamp profiles. An interactive Plating Wizard is provided to help plate stamps. While plating a stamp does eventually get down to brute force comparisons, there is basic analysis that can narrow the choices. This Plating Wizard presents the user with choices based upon analysis of the stamp and then presents the stamps that share those characteristics. The Plating Wizard is a searchable database fueled with information gathered from Dr. Chase's and more recent plating characteristics. By breaking down the 2,600 stamps into a Plating Wizard choice of 2 plates, 1 relief type, 1 guide dot, 1 inner line choice, and maybe a recut option, plating stamps can be broken down into digestible groups, that make the goal of plating a very real probability. With the help of the Plating Wizard to narrow down search results, the prospect of successfully plating stamps is real. The Resources section contains a variety of downloadable pdf's, excel worksheets, links to related websites, and other information that is relevant to this study. A key resource are the Data Tables, which were developed for this study. This study is purely educational and has no commercial purpose. I appreciate all error corrections and suggestions for improvement. If you see anything you deem proprietary and wish it credited or removed, I am happy to do either.